Leeches are blood suckers which are part of the same family as earthworms. They have segmented bodies and utilize suction cups within their mouths to attach themselves to both invertebrates and vertebrates. 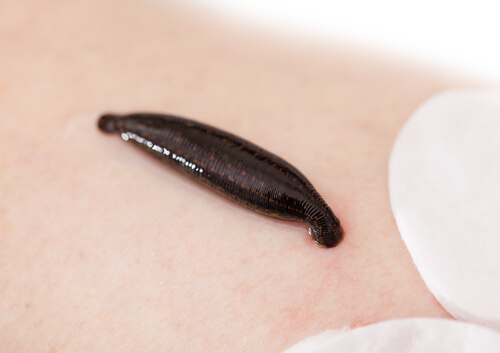 Leeches can appear in manmade ponds, and getting rid of them can be challenging unless you know the right approach, which is highlighted below. Most leeches prefer freshwater habitats, although a few species can be found on both land and sea. There are as many as seven hundred separate species, about a hundred of which are marine with ninety being terrestrial and the other 510 preferring locations such as ponds and lakes. Those who own ponds in the U.S. are most likely to encounter the North American Leech. It is mostly green and brown in color and some specimens will have red or black spots. It can reach a length of 2 inches and thrives in marshes, lakes or any body of water which moves slowly. Although leeches have a bad rep, with knowledge they can be used for medicinal purposes, restoring the circulation of blood. This is called leech therapy which originates in both India and Greece and which spread to Western Europe and the U.S. during the 19th century. They are largely harmless when attaching to humans, in fact in many cases if they come into contact with the skin you won’t even feel them. To get a leech off you or someone else, simply break the suction seal, which can be done easily with your fingernail. This will prompt it to remove its jaws. Leeches usually get into ponds via hitchhiking. They attach themselves to birds, especially heron and ducks, and while enjoying their blood get a first class flight to the pond, where after consuming enough blood they detach themselves and fall into the water. They will then conceal themselves within the roots of plants or pots and make the pond their new home. Depending on the animals you have in the pond, the issue will resolve itself. Many species of fish eat leeches, and they are also consumed by crayfish and turtles. To remove them manually there are a number of steps you can take. First, use products such as Muck Away to keep the pond muck levels under control, which will dissuade the leeches from laying their eggs. Phragmites, debris and cattails should also be removed from the shallow areas as this to will discourage the growth of leeches. Another method of controlling leeches is to utilize leech traps. To do this, take an aluminum or coffee can, punch small holes in them that are small enough for leeches to fit in, then use bait such as raw chicken and put it into the pond’s shallow areas. Once the leeches enter to get the chicken, they won’t be able to exit. Once the can is full, remove it and then repeat until the leeches are gone.